The 2016 Internet Retailer Conference + Exhibition (IRCE) was awesome! We sent the best of the best from our team to exhibit at this year’s show. We walked the floor, talked with customers, attended talks and shook hands until it hurt. Translation: We had a lovely time! We also learned a lot at this year’s IRCE. We got the team together and came up with our top 6 take aways from this year’s show. Magento was there in force with a HUGE booth! The whole team was focused on one thing: Getting new and existing customers to Magento Enterprise. Regardless of size or sales, it seemed like the “only” solution for eCommerce is Magento Enterprise. We’re not necessarily sold on this and will be conducting a webinar all about Magento Enterprise. But, in the meantime, if you talk with Magento, know that they will try to get you on Enterprise or their Enterprise Cloud Edition. We talked with over 50 Magento clients at IRCE and a majority of them are interested in Magento 2.0. Magento 2.0 is pretty darn great, but, sadly, not all the extensions are available for primetime yet. For us, we’re advising our customers to stick with Magento 1.9 for now and give 2.0 a few more months. Talk about the gorilla in the room – Demandware made their presence felt! Demandware’s angle: When (Not if) you outgrow Magento, you should come to us. Indeed, Demandware’s capabilities are incredible, focusing on global retail chains and omnichannel operations. Is it powerful? Totally. Is it worth moving to? Depends on your business case. We went to IRCE for two reasons: Meet new customers and launch Targetbay, our new personalization tool. We were astounded by the aggressive number of personalization tools are IRCE. Basically, if your eCommerce site doesn’t have some sort of personalization solution, then you’re way behind the eCommerce pack. Despite the competition, we had glowing reviews from our Targetbay demo. Does it have a secret sauce? You bet. We heard this too many times to count, loud and clear. It seems like there’s a LOT of eCommerce sites who are working with their current Magento developer, but are not even close to being happy with the relationship. So much so, that we met a potential customer on Wednesday and then signed him four days later. We can’t wait to change his opinion about Magento developers, though! Have a similar story? Contact our Magento team today. 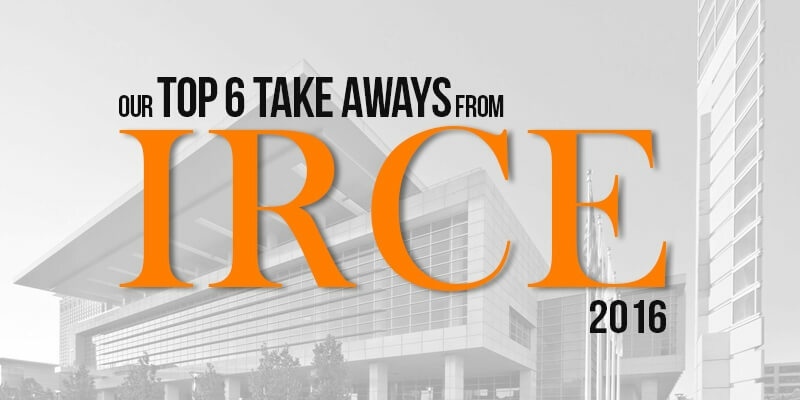 And there you go – Our top 6 take aways from IRCE 2016. We can’t wait for IRCE 2017! Keep an eye out for us there and at Imagine 2017. Until then!